JW Marriott Las Vegas Resort & Spa received numerous prestigious accolades recently including its 10th consecutive AAA 4-Diamond Award as well as awards from U.S. News & World Report, Meetings & Conventions and more. In 2005, JW Marriott Las Vegas Resort & Spa received its first AAA 4-Diamond Award, an honor only 5.3 percent of more than 29,000 hotels qualify, and 2014 marks the resort’s 10th year of earning the distinction. The hotel has continued to receive the ranking each year by delivering the best in customer service and satisfaction through its top-tier luxury, accommodations, abundant amenities and more. Voted as one of the Top 5 Las Vegas Resorts by readers of Condé Nast Traveler, and recognized as a Top-Performing Business on TripAdvisor, the elegant resort has recently added other notable honors to its long history of award-winning service. The latest include 2014 No. 7 ranking for “Best JW Marriott Hotels & Resorts” in the world and No. 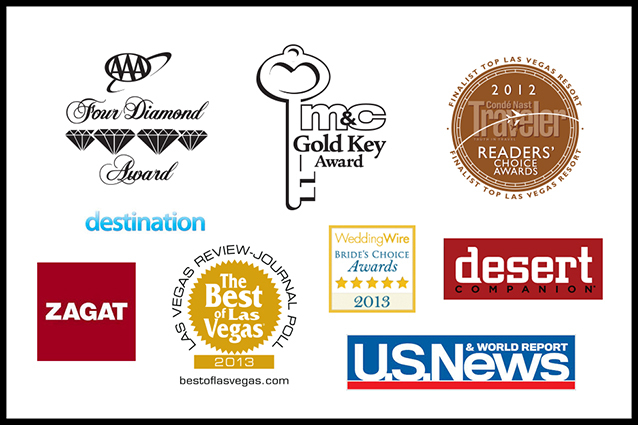 9 standing for “Best Hotels in Nevada” by U.S. News & World Report, a leading website for establishing the finest in travel, education, health and more; “Best Splurge-Worthy Spa” for Spa Aquae in Desert Companion’s Best of the City 2014; 2013 Gold Key Award from Meetings & Conventions magazine, which is given to properties for their overall excellence in serving meetings and events; Ceres Restaurant and Carmel Room received outstanding ratings in the Zagat 2014 Las Vegas Restaurant Survey and Wedding Wire’s 2013 Bride’s Choice Award for Ceremony & Reception Venue, recognizing the resort’s flawless wedding planning and execution. For more information on JW Marriott Las Vegas Resort & Spa, visit www.marriott.com/LASJW. The JW Marriott Las Vegas Resort & Spa offers world-class luxury just 20 minutes northwest of the famous Las Vegas Strip. The award-winning resort celebrates 15 years of success in 2014, along with Rampart Casino, with its “15 Years of Fun” campaign, and it’s sure to be the property’s best year yet with exciting renovations, additions and more. The Las Vegas resort is accessible to Las Vegas Speedway, TPC Las Vegas and a number of other golf courses. The JW Marriott features 548 well-appointed guest rooms and suites set amid 54 acres of lush gardens. Voted as one of the Top 5 Las Vegas Resorts by readers of Condé Nast Traveler, and recognized as a Top-Performing Business on TripAdvisor ranked in the top 10% worldwide for traveler feedback, the Las Vegas resort also includes a full-service spa, state-of-the-art fitness center, 33 meetings rooms with 100,000 square feet of flexible space, more than 10 restaurants serving American, Italian, Japanese and Mediterranean cuisines and the on-site Rampart Casino. For information, visit www.marriott.com/LASJW, Stay up to date with the JW Marriott Las Vegas Resort & Spa on Facebook and Twitter. JW Marriott is part of Marriott International’s luxury portfolio and consists of beautiful properties in gateway cities and distinctive resort locations around the world. These elegant hotels cater to today’s sophisticated, self-assured travelers, offering them the quiet luxury they seek in a warmly authentic, relaxed atmosphere lacking in pretense. JW Marriott properties artfully provide highly crafted, anticipatory experiences that are reflective of their locale so that their guests have the time to focus on what is most important to them. Currently, there are 63 JW Marriott hotels in 25 countries; by 2016 the portfolio is expected to encompass more than 90 properties over 30 countries. Visit us online, jwmarriott.com, @jwmarriott and facebook.com/JWMarriott.